Chandigarh : With bitter memories of large-scale violence fresh in the minds of people, Haryana was on high alert on Sunday as a section of the Jat community started fresh protests in some districts. Paramilitary forces and Haryana Police were monitoring the situation in Jat-dominated districts of Rohtak, Jhajjar, Jind, Bhiwani, Sonipat, Panipat and others. The call to resume the protests has been given by the All India Jat Aarakshan Sangharsh Samiti (AIJASS) headed by Jat leader Yashpal Malik in 19 districts. The Jats are demanding fulfillment of demands like release of youths arrested during the Jat agitation last year, jobs to kin of Jats killed in the agitation and action against officials responsible for firing on Jat agitationists. "Security agencies are keeping a close watch on some Jat leaders, especially those owing allegiance to the AIJASS," a senior police officer said here on Sunday. 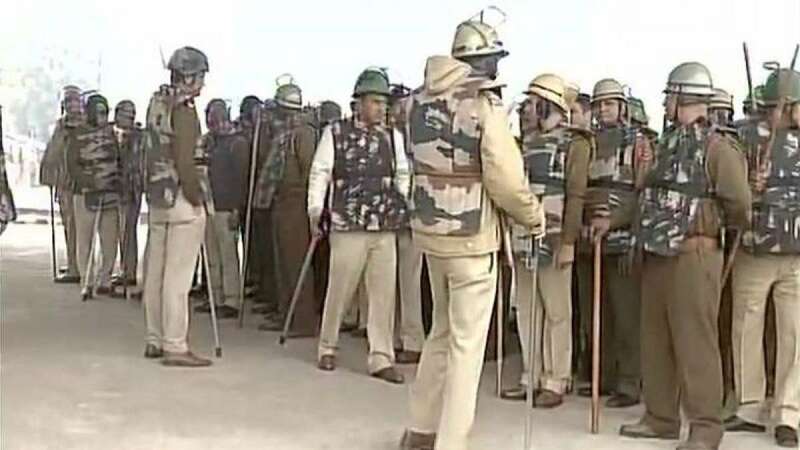 The Haryana government has requisitioned 55 companies of central police forces and ordered the deployment of 7,000 Home Guards, besides the Haryana Police personnel, in districts where trouble was expected. Central forces and Haryana police carried out flag marches in Rohtak and some other places on Saturday to instill confidence among people. The Jat agitation in February last year left 30 people dead and over 200 injured. Rohtak, Sonipat, Panipat, Jhajjar, Jind, Hisar and some other districts were the worst affected during the Jat agitation. Government and private property worth hundreds of crores was damaged and set on fire. Large-scale looting of commercial and business premises and even motorists was reported from the 10 worst affected districts. In a communication to senior officers in districts, the Haryana government last week directed that security of all major critical points like drinking water supply to Delhi in Karnal and Sonipat, traffic movement on the G.T. road (National Highway No 1) and roadways depots should be secured. Haryana Director General of Police K.P. Singh said earlier that if anyone was found indulging in any illegal activity or causing loss to public property, action would be initiated against him. Chief Minister Manohar Lal Khattar has said people should refrain from participating in any agitation. He said the government will strictly deal with the situation if it gets out of hand.